Crossing gates were down and lights were flashing when a Long Island Rail Road train slammed into an abandoned car on the tracks in Mineola last Friday, instantly sparking a huge fireball that streaked along the tracks as the train crashed to a stop, surveillance video obtained by News 4 shows. Pei-Sze Cheng reports. Crossing gates were down and lights were flashing when a Long Island Rail Road train slammed into an abandoned car on the tracks in Mineola last Friday, instantly sparking a huge fireball that streaked along the tracks as the train crashed to a stop, surveillance video obtained by News 4 shows. Incredibly, no one was hurt in the train-versus-car crash at Main Street and Willis Avenue just before 8 p.m. The fire spread to a nearby building, which was evacuated as firefighters responded. Another video from inside a store facing the tracks captures the shock when employees see the train hit the car. One man instantly throws his hands to his head in disbelief, then rushes with his co-worker to their phones. "The whole store shook. We heard a boom," said Annemarie Lespinasse, who works at Fox's. 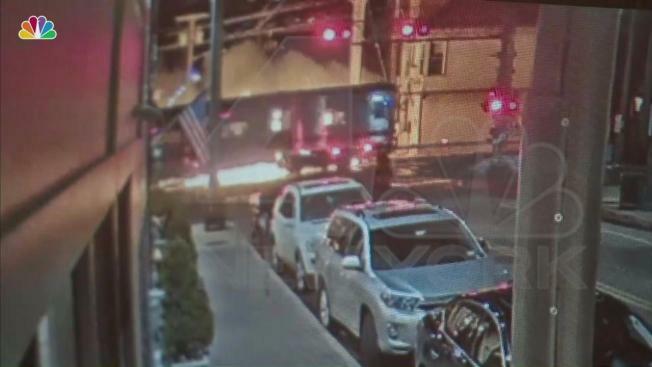 Exclusive video sourced by NBC 4 shows the moment a Long Island Railroad train struck an unoccupied car on the tracks in Mineola, causing a huge fireball and a man in a nearby shop to leap and run, yelling "'Oh my God!" It's not clear how the car ended up on the tracks, but Fox's IT employee Ivan Riberio says drivers commonly turn onto the train crossing because they think they're following the GPS directions onto a street next to the tracks. "There's a street right after the tracks. My assumption is that they're thinking they're turning to the streets, thinking they're following the GPS, but they're really turning onto the tracks," said Ribeiro, adding that it doesn't help that the crossing gets very dark at night. "I've seen it multiple times." He thinks the car in Friday's crash may have gotten stuck on the tracks, and the driver ditched the vehicle before the train hit it. Ribeiro wants to see more signange and lights by the crossing. The fire on the tracks Friday knocked service out to the Mineola station for days.